By Keith Cowing on January 31, 2010 8:00 PM. Keith's update: Late Sunday night NASA announced that the NASA budget press conference slated for 3:00 pm EST on Monday has been cancelled in favor of a dial-in media telecon at 12:30 pm EST. Instead of the original plan to give the media 2.5 hrs to review budget info before the press conference it would seem they will have no time to review it - so don't expect much in the way of informed questions - on a telecon certain to be overcrowded. According to NASA: "To dial into the news conference, news media representatives should call: 800-857-5728 or 1-630-395-0025 and use the pass code "NASA". A limited number of phone lines are available, so people are encouraged to call early. Replays of the teleconference will be available approximately one hour after the call ends. To listen to a replay, call: 866-431-2903 or 203-369-0952." - 1 Feb: OSTP 2011 Federal R&D Budget Briefing: OSTP officials brief media and "stakeholders" at the AAAS from 1:00 to 2:00 pm EST. Webcast (registration required). Lori Garver will be there. Budget materials will be online at OMB at this point. - 3 Feb: Space and Aeronautics Subcommittee - Hearing: Key Issues and Challenges Facing NASA: Views of the Agency's Watchdogs: 10:00 am EST - hearing runs for two hours. You can expect Subcommittee Chair Rep. Giffords to pick up where she left off at a previous hearing wherein she will bash Norm Augustine and the Administration's plans to change the Constellation program - specifically Ares 1. ASAP Chair Adm. Dyer will be in agreement with Giffords for the most part but NASA OIG Martin will probably end up pointing to the OIG's previous work (and GAO's) which cast continual doubt about the pace and maturity of the Constellation program - as implemented by NASA. - 12 Feb: The State of the Agency: NASA Future Programs Presentation: All day. Don't bother to RSVP - there are no more seats available. Watch it on NASA TV. NASA is only allowing some media (Space News and Nature) into the event (where they can ask questions) while other publications/websites are not being allowed to send representatives. I am told this has to do with seating limits. Duh. No one seems to have planned for media. Oh well. These events are held every year and tend to be rather bland and dumbed down. Mostly its like a low key high school reunion where retirees get generic updates as to what the agency is doing. However, given that this event happens the day after the AST event, lots of questions will be floating around - so it may be a little more peppy than it would otherwise be. - 18-19 Feb: NASA Advisory Council Meeting: You will certainly see additional detail presented by Bolden and senior staff at this meeting - i.e. charts to back up previous public comments. Media may manage to grab Bolden et al in the hallway. - 17-20 Feb: Next-Generation Suborbital Researchers Conference: Lori Garver speaks on Thursday, 18 February. Given the high amount of commercial interest and participation in this event and some exciting presentations by others, you can be certain that more detail on NASA's commercial plans will emerge one way or another. By Keith Cowing on January 31, 2010 1:56 PM. "Scientists say they have solved a crucial puzzle about the AIDS virus after 20 years of research and that their findings could lead to better treatments for HIV. British and U.S. researchers said they had grown a crystal that enabled them to see the structure of an enzyme called integrase, which is found in retroviruses like HIV and is a target for some of the newest HIV medicines. "Despite initially painstakingly slow progress and very many failed attempts, we did not give up and our effort was finally rewarded," said Peter Cherepanov of Imperial College London, who conducted the research with scientists from Harvard University. 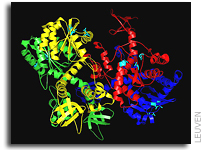 The Imperial and Harvard scientists said that having the integrase structure means researchers can begin fully to understand how integrase inhibitor drugs work, how they might be improved, and how to stop HIV developing resistance to them." Keith's note: The next time someone asks you what the value of growing large, perfect protein crystals is in biomedical research (such as those grown on the ISS) refer them to this discovery. In this instance, these crystals were grown on Earth, not in space. But I wonder if a zero G-grown crystal would have accelerated their research? Perhaps if NASA dropped (eliminated) the cost, others could utilize this facility more readily? By Keith Cowing on January 31, 2010 1:43 PM. "White House spokesman Nick Shapiro said Sunday, "The President is committed to a robust 21st century space program, and his budget will reflect that dedication to NASA. NASA is vital not only to spaceflight, but also for critical scientific and technological advancements. The expertise at NASA is essential to developing innovative new opportunities, industries, and jobs. The President's budget will take steps in that direction." "Getting to space is about to be outsourced. The Obama administration on Monday will propose in its new budget spending billions of dollars to encourage private companies to build, launch and operate spacecraft for NASA and others. Uncle Sam would buy its astronauts a ride into space just like hopping in a taxi." "During the State of the Union, I turned to David Gregory and Andrea Mitchell and blurted out the obvious: I could never be president. The specific reason I gave was that I'd bankrupt the nation by re-starting an all-out push into space - back to the moon, to Mars and beyond." "Everyone in Washington wants fiscal restraint these days - except when it comes to their priorities. Case in point: NASA. Texas lawmakers in both parties are girding for battle with the Obama administration over the future of human spaceflight. Many of the same lawmakers routinely accuse the president of sending deficits into the stratosphere." By Keith Cowing on January 30, 2010 7:52 PM. "[Ross] Tierney, an amateur space buff, is an outspoken advocate for Jupiter Direct, a rocket designed to replace NASA's Ares 1 and Ares V, the two launch vehicles at the heart of NASA's Constellation program. " "We were received well, but they were very clear they are offering no opinions at this point," says Ross Tierney, a collectible space model kit designer from Florida who presented the alternative plan. Keith's note: Dear DIRECT Fanboys: NASA has not selected a specific design to replace Ares V. It most certainly has not decided to build DIRECT or any variant thereof. According to how NASA sources tell me the process will unfold, if/when NASA decides to go ahead and procure a replacement for Ares V or any other heavy lift launch system, it will do so via standard commercial procurement process - just like it is going to be doing for LEO access. Newsflash: the shift is going to be away from government-mandated designs (i.e. DIRECT) toward launch solutions to be provided by the private sector. The fact that a toy rocket model company owner was asked to come to NASA HQ and talk about a rocket design - one whose actual "designers" can never be named - was simply a courtesy - a curious one at that - not a statement of support. After all this time, I have to wonder why no one except these people are ever associated - by name - with this concept. I cannot fathom that NASA would make any rational decision about launch vehicles based on anonymous designers - especially when the "team" is led by a foreign national who runs a toy rocket model company and uses a blurry image of Werner von Braun on a website instead of showing his face. Imagine the inevitable congressional hearing: Charlie Bolden tells Congress that NASA is going to throw away $8 billion worth of rocket design done by professional rocket designers and adopt a design whose team is mostly anonymous and is lead publicly by foreign national model rocket designer? As Augustine Commission member Leroy Chiao once asked "Who are you guys?" By Keith Cowing on January 30, 2010 4:10 PM. "The X-15 was the ultimate "X" vehicle. Built in the 1950s, she became the fastest and highest-flying winged aircraft of its time. During 199 flights from 1959 through 1968, she collected data about hypersonic flight that was invaluable to aeronautics and to developers of the space shuttle. This book describes the genesis of the program, the design and construction of the aircraft, years of research flights and the experiments that flew aboard them." By Keith Cowing on January 29, 2010 4:46 PM. Keith's note: Word has it that HQ organizations finally got their FY 2011 budget numbers around 3 p.m. EST today. Is VASIMR Part Of NASA's New Architecture? By Keith Cowing on January 29, 2010 4:18 PM. "NASA/JSC has a requirement for the acquisition of services to update a magnet fixture with an additional cryocooler for conduction cooling and to eliminate the liquid cyrogen cooling system in preparation for crycooler testing in vacuum and magnetic field combined environments. In addition, Studies will be conducted to evaluate a Lunar Tug concept utilizing Variable Specific Impulse Magneto-plasma Rocket (VASIMR) engine capabilities from Low Earth Orbit to Lunar Orbit and libration points. NASA/JSC intends to purchase these services from Ad Astra Rocket Company." Continue reading Is VASIMR Part Of NASA's New Architecture?. By Keith Cowing on January 29, 2010 3:38 PM. "NASA Administrator Charles Bolden will brief reporters about the agency's fiscal year 2011 budget at 3 p.m. EST on Monday, Feb. 1. The news conference will take place in the James E. Webb Memorial Auditorium at NASA Headquarters, located at 300 E St. S.W., in Washington. NASA Chief Financial Officer Beth Robinson will join Bolden. The news conference will be broadcast live on NASA Television and the agency's Web site. Questions will be taken from media representatives at headquarters and participating field centers." By Keith Cowing on January 29, 2010 2:54 PM. "For instance, Space Exploration Technologies (SpaceX) has conducted five launches of its simple Falcon 1, four of which failed (three totally, one partially). The company has learned from its failures and is working on upgrades. The more complex Falcon 9, designed to carry cargo to the ISS, is two years behind schedule and has yet to be launched. Moreover, this is the same vehicle they say can carry crew to ISS within three years." Keith's note: It is rather hilarious for Scott Horowitz to cite one company's developmental woes and yet ignore the immense problems, delays, and cost overruns that his Ares 1 team had. Go look at the Atlas' flight record when they flew John Glenn. Newsflash, Scott: SpaceX was flying a real rocket from the onset - not a cobbled together one-off rocket (Ares 1-X), half of which was a dummy inert mass that experienced an anomalous post-staging flight profile, damaged its first stage, etc. And Scott, let us not forget, your rocket - one that would still not fly for the first time for another few years (according to your own schedule) - would be flying crew within a similar time frame as Falcon 9 - yet doing so with a spacecaft (Orion) that was constantly reduced in capacity and underpowered due to flaws inherent in your rocket's design. Even if you were to double the amount of launch/testing problems Falcon 1/Falcon 9 will end up costing a small fraction of the $8-9 billion you wasted and will be working in space sooner - and more cheaply - than Ares 1 would ever have been capable of doing. Face it Scott - you placed all your (our) money on the wrong rocket. As for astronauts flying on rockets, I wonder what Ken Bowersox knows that you do not? By Keith Cowing on January 29, 2010 12:54 PM. Keith's note: A paradigm shift is in the making - a shift from government-operated to private sector operated human and cargo transportation systems. Of course, everyone wants to get a word in about this. How two groups express their support points to a shift in how this will happen. It is one thing to wave your arms around about what is broken and offer semantic solutions. It is quite another to quietly build vehicles to make this actually come to pass. Witness the attitude difference between two pro-space commercialization organizations - one old (and tired) one new and fresh. I'll take CSF's forward-looking approach any day. "At a time when job creation is the top priority for our nation, a commercial crew program will create more jobs per dollar because it leverages millions in private investment and taps the potential of systems that serve both government and private customers. We have a tremendous opportunity here to jump-start private activity in low-Earth orbit that will further lower the cost of access to space and unleash the economic potential of space long promised." "The Space Frontier Foundation has been fighting to kill Ares I for years. We predicted this disaster in 2006 , put out press releases, op-eds and worked with our many friends inside NASA, Congress, and both large and small NewSpace companies. ... Our Mind the Space Gap campaign emphasized that Ares was a boondoggle that guaranteed sending more taxpayer money to Russia to pay for Astronaut visits to a space station we mostly paid for," continued Werb. "Now the NewSpace industry must step up and fill the Gap, creating jobs and innovation here in America." By Keith Cowing on January 29, 2010 10:46 AM. "The expansive, multimonth technical study, still in the preliminary stages, might be similar to the Exploration Systems Architecture Study that in 2005 settled on the design of the agency's program to return astronauts to the Moon by 2020." Keith's note: Forget the long-rumored, ponderous "ESAS 2" activity folks. It is not really needed. Charlie Bolden and a small team have already (quietly) put the basic architecture in place. Think LEO, cis-lunar, near-Earth, and inner solar system utilization and exploration of space - all with a significant, paradigm-shifting emphasis on the use and participation of the private sector and (eventually) partnerships with other nations. Look back a few years at previous "architectures" and you will get the basic idea. All Bolden's team needed to wait for was the final word from the White House. After half a decade, NASA's human space flight program may have unfortunately "lost the Moon" -- but it may be about to gain the solar system - that is, if Congress wants it to happen. Stay tuned. Keith's update: Let me add (with a prod from Anne Spudis) is that I think it is short-sighted to exclude the Moon as part of the so-called "Flexible Path". We have unfinished business on the Moon - and the resources needed to fully utilize the inner solar system are waiting there for us to utilize. One would hope that the "Flexible Path" is truly "flexible" and not just this Administration's euphemism for "not ESAS". By Keith Cowing on January 29, 2010 10:02 AM. "Six demonstrators plan to be in front of NASA Ames' main gates at noon today, carrying signs that read "No Tax $ for Animal Abuse" and "Stop Radiation Tests on Monkeys," according to a PETA statement." By Marc Boucher on January 29, 2010 12:00 AM. "NASA's Kennedy Space Center, Fla., will pay tribute to the crews of Apollo 1 and space shuttles Challenger and Columbia, as well as other NASA colleagues, during the agency's Day of Remembrance observance on Friday, Jan. 29." By Keith Cowing on January 28, 2010 11:55 PM. "January 28, 2010 - Twenty-four years ago today the space shuttle Challenger and its crew of seven men and women launched into a clear blue sky at the Kennedy Space Center in Florida. Their mission, designated 51-L, was cut short that day, but their legacy of exploration and discovery lives on at nearly 50 Challenger Learning Centers worldwide. A special podcast has been created to honor the Challenger crew as well as the Apollo 1 and Columbia astronauts. All will be honored this Friday during NASA's Day of Remembrance." "I was fast asleep when the Challenger exploded. It was almost high noon - but I had turned in only about three hours before. I had spent the night in a citrus grove in Polk County, Florida. I was a general assignment reporter for a TV station in Tampa, and we were up all night providing viewers constant updates on the record freeze. The fate of the citrus crop is very big news in that part of the world. ... When the call came from the assignment desk, I was in a deep sleep, so it took me some time to comprehend what I had just been told: "You are not going to believe this, but the shuttle has blown up." "Building memorials to lost comrades is as old as humanity. Humans have been looking at special places and building evocative monuments - often of great complexity and utility back to the era of Stonehenge - and perhaps earlier. So there was something primal - transcendent - about building these ancient structures to honor people whose job entailed trips above the sky." "Several hundred invited guests gathered at the Embassy of Israel on that cold, wet night to remember Ilan Ramon. Daniel Ayalon, Israel's Ambassador to the United States began the event by recalling his pride at the launch of the mission. He talked of Ilan as the son of a holocaust survivor, a veteran of many dangerous missions in the defense of the Israeli nation, and the country's first astronaut. His story, he said, epitomized the story of Israel and the Jewish people. The entire country had been waiting for Columbia to return, and Ayalon said, the pain of its loss would always be with them." By Keith Cowing on January 28, 2010 10:58 PM. "A few news bureaus and bloggers have been reporting on some major changes coming our way. Sometimes the number of reports gives the impression of validity when in fact they are all reporting on the same rumor. I can tell you that I have not received any direction or information that would confirm what they are saying. That being said, it wouldn't surprise me to find out that there will be some changes announced next week and that they may be significant. Again, I have no specific information on what that might be." "The total cost of the mobile launcher project is estimated at around $500 million, according to NASA. But the ultimate fate of the skyscraping tower is up in the air as the White House appears on the brink of canceling the Ares 1 rocket and scrapping NASA's Constellation program taking aim on the moon." Keith's note: I can certainly empathize with the Constellation folks: I was part of the Space Station Freedom team at Level II and we sat around for months working on a program that we knew was (more or less) going to be totaly overhauled as innumerable redesigns went on around (and often without) us. It was maddening. But we just kept on working because that was our job. We did not have the Internet back then - just NASAMail and fax machines. FWIW I do not think that all of the work done on Constellation will have been done in vain. Indeed, I see lots of "Freedom" in the ISS. Worry not: the hard work done by Constellation folks will certainly emerge elsewhere - eventually. Whatever happens, y'all done good. 2001's Newspad = 2010's iPad? By Keith Cowing on January 28, 2010 9:32 PM. "Those who read Arthur C. Clarke's novelization of the movie will remember that he described this device as the "Newspad," something that was used by people of the future (as envisioned in 1968) to watch TV and read newspapers. You can read the full description of the device after the break -- it's described as a newsreader, with two-digit codes for each article online, and a constant stream of information from the hourly updates on "electronic papers." By Keith Cowing on January 28, 2010 6:52 PM. "Today we have in orbit a $75 billion International Space Station, a product of the treasure and effort of 15 nations, and the president is recommending that we hold its future utility and, indeed, its very existence hostage to fortune, hostage to the hope that presently nonexistent commercial spaceflight capability can be brought into being in a timely way, following the retirement of the Space Shuttle." "So it is a real dilemma - it is a real dichotomy: how do we engage competition and position ourselves to take advantage of the successes and accept the failures which inevitable occur in that environment while, at the same time, meeting the goals and objectives that we have as managers? What I've come to, after considerable thinking (with some discussion and modifications to come) - for NASA: the best way to do that is to utilize the market that is offered by the International Space Station and its requirements to supply crew and cargo as the years unfold." By Keith Cowing on January 28, 2010 6:39 PM. "The money in the president's budget is not enough to follow through with NASA's Constellation moon landing plan initiated by President George W. Bush. An aide to an elected official who was told of Obama's plans, but who asked that his name not be used because of the sensitivity of the discussions, said Obama is effectively ending the return-to-the-moon effort, something that has already cost $9.1 billion." "The President has pledged to minimize the spaceflight gap and Space Coast families are looking for him to fulfill that promise. It will be unacceptable if his budget does not reflect a commitment to a robust human spaceflight program." "My biggest fear is that this amounts to a slow death of our nation's human space flight program; a retreat from America's decades of leadership in space, ending the economic advantages that our space program has brought to the U.S., and ceding space to the Russians, Chinese and others. I will do all that I can to stop this ill-advised plan." By Keith Cowing on January 28, 2010 6:24 PM. "Here's my question to you: Should NASA's plans to return to the moon be scrapped for budgetary reasons?" By Keith Cowing on January 28, 2010 2:53 PM. "NASA Administrator Charles Bolden spoke with the press at the Ilan Ramon International Space Conference. Bolden related to a number of exciting topics in the field of space and beyond. In the following video the NASA Chief discusses the option of sending another Israeli astronaut into space, the mission of saving the planet from asteroids, and commercial flights to the moon." "NASA and the Israel Space Agency have signed a joint statement that recognizes the Israel Network for Lunar Science and Exploration, or INLSE, as an affiliate partner with the NASA Lunar Science Institute at the agency's Ames Research Center in Moffett Field, Calif."
By Keith Cowing on January 28, 2010 10:17 AM. "I've read what you've read," said Steve Cook, who ran the Ares rocket component of Constellation at Marshall Space Flight Center from conception until leaving for a job in industry in September. "This is just a lot of speculation," Cook said Wednesday. "We just need to wait and see what the president does." Constellation employs about 1,500 contractor employees and 700 government workers at Marshall Space Flight Center, Cook said." "I personally believe the rumors are likely to be true," said Griffin. "If they're true it's a very bad day for the nation and the space program." Griffin said tens of thousands of people will be effected by cuts." Keith's note: Ares 1 is dead and Ares V is morphing into a commercially-provided HLV for TBD uses. The ISS will be serviced by commerical spacecraft for crew and cargo (not by Orion) and deep space "Flexible Path" missions will almost certainly use something other than Orion for crew transport. As such, there is not going to be much left of "Constellation". There Is More To All Of This. $5.9 Billion More. By Keith Cowing on January 27, 2010 8:37 PM. Keith's note: Reliable sources tell me that all of the arm waving and negative stories (many sourced directly from within NASA BTW) that have been flying around do not constitute the entire picture of what NASA is going to get and what it is going to be asked to do. Indeed this is only part of the story. This back and forth is going to continue - all from folks inside NASA - until the actual budget with the full picture is released. As the picture continues to emerge, not only is the push for commercial crew and cargo to the ISS going to expand in the new budget, but that push for commercialization will cover all aspects of American human spaceflight - LEO and beyond, cargo and capsules, and even the development of HLVs. This will all be done as part of an overall agency budget increase of $5.9 Billion over the next 5 fiscal years. Notice below that NASA only saw fit to talk with some - but not all - of the media before the budget release while details of the budget are still under Administration embargo. Yet another example of how Morrie Goodman seems to be trying to parse access to the agency by the media. Update: I have now learned that these media briefings were set up directly by the White House - not NASA PAO. Looks like the White House decided to take NASA PAO out of the loop. Not a good sign. Sorry Morrie. "President Barack Obama will propose $6 billion in new funding for NASA over the next five years, administration officials said Wednesday. The proposed increase, which will be part of the president's fiscal 2011 budget request on Monday, aims to encourage the use of commercial rockets and extend use of the International Space Station until at least 2020 as the agency switches priorities away from sending astronauts back to the moon." "The news teleconference at which the officials and astronaut spoke was organized for reporters at two Florida newspapers in response to the Orlando Sentinel's report on Tuesday, which said the White House budget next week would kill NASA's plans to return astronauts to the moon and scrap the rockets being developed to take them there. On the teleconference was an administration official, a NASA official and Sally Ride, the first American woman in space. ... But the NASA official stressed that just because the Constellation program to return humans to the moon and its Ares I and Ares V rockets were going to be canceled did not mean that the Obama administration was abandoning exploration and human spaceflight." By Keith Cowing on January 27, 2010 10:50 AM. "Instead of blasting off to the moon, NASA's hopes for a manned mission there have been blasted to pieces, sources in the White House, Congress and NASA tell the Orlando Sentinel." "When the White House releases its budget proposal Monday, there will be no money for the Constellation program that was to return humans to the moon by 2020. The Ares I rocket that was to replace the space shuttle to ferry humans to space will be gone, along with money for the Ares V cargo rocket that was to launch the fuel and supplies needed to return to the moon. There will be no lunar landers, no moon bases. "We certainly don't need to go back to the moon," one administration official said." "Michael D. Griffin, the former NASA administrator who oversaw the creation of Constellation and remains a staunch defender, said that would be a mistake. "I can't imagine the situation where the United States doesn't want to have end-to-end capability to reach the lunar surface," Dr. Griffin said." "Far from getting the $3 billion more each year that experts suggest NASA needs for meaningful human spaceflight, President Barack Obama is expected to offer little new money to the space agency when his budget is released Monday. Although there's no official word from the White House or NASA, space policy analysts and legislators say it's likely the space agency's budget will remain "flat" for the coming year, potentially leaving humans stuck in near-Earth orbit for the foreseeable future." Keith's note: NASA has just spent more than half a decade telling Americans that we are all going back to the Moon - and why. In the process, billions of dollars have been spent. Children have grown up being told this again and again - just like my generation heard in the 1960s. Now this is being taken away from them. I can only imagine how my generation would have reacted. It is one thing to alter a plan, change rockets, etc. But it is quite another to abandon the plan altogether. The ISS has great potential - much of it yet to be realized. But much of that untapped potential was preparing humans to go out into the solar system. Now those destinations have evaporated and have been replaced with the elusive and ill-defined "Flexible Path". How is NASA going to explain this about face? Answer - they won't - because they can't. They are incapable of admitting mistakes or even stating the obvious. What I really want to see is how NASA attempts to explain this bait and switch to all of the students it has sought to inspire since the VSE was announced. A "Summer of Innovation" centered around a stale and contracting space program seems somewhat contradictory to me. How will NASA - and the White House - explain the use of vast sums of taxpayer money to bail out the decisions of incompetent financial institutions on Wall Street and yet not be able to find a paltry fraction of that amount to bail out the future of space exploration that future Americans will benefit from - and participate in. I just spent a few days wandering around Yosemite looking up at vast expanses of rock such as El Capitan - things that humans have surmounted - and yet still inspire later generations to attempt. Now I have to fly home and witness the slow motion dismemberment of NASA's human exploration program. You will pardon me if I fell like I have been whip lashed. There are two options open to those who wish to explore the solar system - personally. One is to ignore NASA altogether and promote commercial space. The other is to totally overhaul NASA once and for all. Despite its collection of incredibly skilled and motivated people, NASA is also a bumbling behemoth that cannot get out of its own way. Personally, I think the best approach is to pursue both. But something needs to change. Clearly the status quo has utterly failed and yet another generation is at risk of missing out on the chance to personally explore space. It is my understanding that Charlie Bolden worked very, very hard on getting more for NASA. So the blame for these cutbacks should not be laid on his shoulders. He does have a chance, however, to use this opportunity to truly reconfigure the agency in response to this slap from the White House. The last time NASA was in this situation in the mid-1990s, its Administrator simply did not understand that his people were his greatest asset. Charlie Bolden does not have that character flaw. NASA is simply going to have to do more with less. NASA has little choice at this point than to look for the silver lining in all of this. In so doing, Bolden's people - all of them - contractor, civil servants, and others - need to step up to the task of finding this silver lining - or get out of the way and find something else to do so that others can fix things. Keith's update: This reader note says it all: "Tomorrow the President and Vice President will be together in Florida to announce they are awarding $2.5 billion (of the $8 billion federal dollars slated for similar projects) to build a high-speed rail system from the Tampa airport to Disney World. It will help people visit entertainment venues at Disney World (Space Mountain), Epcot (Spaceship Earth), Universal Studios (A Day at The Park with Barney)." To be certain a job is a job - but I wonder how well these new jobs will offset the old jobs being lost in the KSC area. Will workers be able to move from one to another? I doubt it. Also, the fact that the Obama Administration seems to be more interested in moving tourists to see fantasy depictions of space exploration as opposed to doing the real thing speaks volumes. What sort of message is this sending? By Marc Boucher on January 26, 2010 1:55 PM. "After six years of unprecedented exploration of the Red Planet, NASA's Mars Exploration Rover Spirit no longer will be a fully mobile robot." Marc's note: After all these years Spirit keeps on giving. Good news in an otherwise difficult time for NASA. By Keith Cowing on January 25, 2010 11:43 PM. Keith's note: Hmm... Rep. Gabrielle Giffords, known Ares 1 hugger, who is anti-commercial spaceflight and an Augustine critic - and Joe Dyer (ditto) at the same hearing. Gee, I wonder what they will talk about ... There will be a NASA press conference to discuss the budget on 1 Feb and some sort of event at the National Press Club on 2 Feb. Rep. Giffords is holding her hearing on 3 Feb. Should make for some interesting news. NASA: Time To Do More With Less, Do Less, or Do Things Differently? By Keith Cowing on January 25, 2010 10:30 PM. "President Barack Obama intends to propose a three-year freeze in spending that accounts for one-sixth of the federal budget--a move meant to quell rising concern over the deficit but whose practical impact will be muted. To attack the $1.4 trillion deficit, the White House will propose limits on discretionary spending unrelated to the military, veterans, homeland security and international affairs, according to senior administration officials. Also untouched are big entitlement programs such as Social Security and Medicare." "Under mounting pressure to rein in mammoth budget deficits, President Obama will propose in his State of the Union address a three-year freeze on federal spending that is not related to national security, a concession to public concern about government spending that could dramatically curtail Obama's legislative ambitions." NASA: Less Money, New Direction? By Keith Cowing on January 25, 2010 6:32 PM. "NASA will not be getting the $1 billion budget boost civil space advocates had hoped to see when President Barack Obama sends his 2011 spending proposal to Congress Feb. 1, requiring the U.S. space agency to make even tougher than expected choices about the future of its manned space program, according to sources with close ties to the administration." "Despite the decision not to hold a separate unveiling of Obama's vision, senior adviser David Axelrod said the president was "committed" to NASA and that his belief in space would be revealed with the agency's 2011 budget. Axelrod would not comment, however, on whether NASA would see an increase in its 2010 budget of $18.7 billion." Keith's note: The recent loss of Ted Kennedy's Senate seat to a Republican and other political disappointments seem to be causing the White House to pull back on public commentary regarding a number of things - especially ones that do not have solid, unrelenting public (and political) support. As is always the case with NASA, hope springs eternal that NASA will be mentioned in the State of The Union address. That would seem to be increasingly unlikely - as is the (once hoped for) prospect of a separate i.e. high profile stand alone event wherein the President laid out his plans for NASA. As such, come budget time, NASA will once again slip back into the weeds, fly under the radar, etc. However, those who would automatically interpret such shyness in terms of rhetoric on the part of the White House as being indicative of lack of support for NASA might be surprised. The White House is about to disturb a whole new set of hornet nests as it attempts a paradigm shift in how America does things in space by seeking to truly commercialize human space flight to the ISS. By Marc Boucher on January 25, 2010 3:59 PM. "According to the creation myth, in the beginning, NASA was full of young, cocky, innovative, hard charging folks who got us to the moon inside a decade. They were brash, confident, and did not suffer fools gladly. If they were worried, they didn't show it. Stories abound of 100+ hour work weeks end to end, almost impossible to believe. Their theme -as posted on the factory walls - was 'waste anything but time'. Going to the moon was the clich for doing the impossible and they were going to be the ones to do it. They were the epitome of risk-taking, innovative, creative, flexible, nimble, achievers." By Keith Cowing on January 24, 2010 8:53 PM. "The White House has decided to begin funding private companies to carry NASA astronauts into space, but the proposal faces major political and budget hurdles, according to people familiar with the matter. The controversial proposal, expected to be included in the Obama administration's next budget, would open a new chapter in the U.S. space program. The goal is to set up a multiyear, multibillion-dollar initiative allowing private firms, including some start-ups, to compete to build and operate spacecraft capable of ferrying U.S. astronauts into orbit--and eventually deeper into the solar system." By Keith Cowing on January 23, 2010 7:12 AM. NASA IndustryEducation Forum, online at Paragon Space Development Corp.
"On December 3, 2009, the NASA Office of Education hosted the NASA IndustryEducation Forum at NASA Headquarters in Washington, DC. The purpose of the NASA Industry Education Forum was to obtain ideas on how NASA and industry can make a demonstrable impact on student achievements in STEM and their desire to pursue careers in the aerospace industry. Aerospace companies who had demonstrated success in STEM workforce development were invited. Participants presented innovative ideas to increase our collective impact on the future aerospace workforce. The forum accomplished its intent: provide a mechanism to start a dialog, identify areas for collaboration and explore next steps. ... A full report as well as well as a strategy for moving forward will be provided to participants and others upon request. ... Pictures of the opening general session can be found at the following website: "
Keith's 30 Dec update: I sent an email to NASA's AA for Education, Joyce Winterton asking "Why are events like this not publicly announced? Why isn't the outcome of this event posted on NASA.gov?". She replied today "Thank you for your interest in the discussions NASA recently held with industry representatives who are working in the area of STEM education. The outcome of the discussions will be on the NASA education section of the website early in January." I still do not understand why NASA does not tell the public what it is doing or why it takes a month to post such things on a website. Keith's 14 Jan update: It is now mid-January. Still nothing posted. Keith's 23 Jan update: It has been a month and a half since the event. Still nothing posted. Strange given the White House's interest in education these days. By Keith Cowing on January 22, 2010 11:11 PM. Ares I: Is it on or off? Decision probably will come soon on NASA rocket, Huntsville Times. "The future of NASA seems to be in a tense hold - not unlike the delays that sometimes plague rocket launches - waiting for a presidential directive to set its future course. At stake is the Marshall Space Flight Center-managed Ares I rocket, a space shuttle replacement with its future in doubt and more than 1,500 jobs across the Tennessee Valley hanging in the balance." Keith's 19 Jan note: Ares 1 is dead, folks. DEAD. So is the use of Orion in LEO for trips to the ISS. Use of Orion to destinations in cis-lunar space? That is still open. Ares V as currently designed is dead but there will be a heavy launch vehicle - the debate is between an inline shuttle-derived launch vehicle for crew and cargo and a sidemount shuttle-derived launch vehicle. The sidemount concept is losing favor - fast - due to crew escape concerns. Watch for a significant commercial focus such that NASA may well use a commercial provider to launch crews into space - in a vehicle that meets NASA specs - on a launch vehicle (not necessarily the same each time) that also meets NASA specs. NASA may well be about to bow out of providing human launch services - at least for LEO. Details? Watch for Charlie Bolden's speech at the 11 Feb session of FAA's AST conference. The news for MSFC is not good - and it is not necessarily good for JSC either. Continue reading Mike Griffin's ESAS Architecture is Dead. By Marc Boucher on January 22, 2010 2:56 PM. - Is there a national consensus for human exploration beyond Earth orbit, despite the inherent risks and the substantial cost? - If so, what destination or destinations should NASA's human exploration program explore? Should the Moon remain the target, as under current plans? Should there be a graduated sequence of targets as in the Augustine committee's "flexible path" option? - If human exploration beyond Earth orbit is too costly or too dangerous, should NASA focus its efforts on human missions in Earth orbit, robotic exploration, technology development, other activities such as science and aeronautics, or some combination of these? - Should the space shuttle program be terminated at the end of 2010 (or in early 2011) as currently planned? If so, how should the transition of the shuttle workforce and facilities be managed? If the shuttle program is to be extended, what actions are needed to ensure the safety of its crews after 2010, and what impact will its continuing cost have on the availability of funds for other NASA programs? Continue reading The Future of NASA - A Congressional Research Service Report. By Marc Boucher on January 21, 2010 6:14 PM. "Despite the ASAP Report's contention that commercial vehicles are "nothing more than unsubstantiated claims," the demonstrated track records of commercial vehicles and numerous upcoming manifested cargo flights ensure that no astronaut will fly on a commercial vehicle that lacks a long, proven track record. The Atlas V, for example, has a record of 19 consecutive successful launches and the Atlas family of rockets has had over 90 consecutive successes, and dozens of flights of the Atlas, Taurus, and Falcon vehicles are scheduled to occur before 2014 in addition to successful flights already completed."." "The panel's report provides a summary of key safety-related issues the agency confronts at this time," ASAP Chairman Joseph W. Dyer said. "The most important relate to the future of the nation's human spaceflight program. Critical safety issues the panel reviewed include human rating requirements for potential commercial and international entities, extension of the shuttle beyond the current manifest, the workforce transition from the shuttle to the follow-on program, the need for candid public communications about the risks of human spaceflight, and more aggressive use of robots to reduce the risk of human exploration." By Marc Boucher on January 20, 2010 4:15 PM. "A commercial space pioneer and a former astronaut are answering claims by an independent advisory panel that private companies do not meet NASA human-rating standards and last year's presidential review of the space program did not adequately consider safety. In an annual report released Friday, the Aerospace Safety Advisory Panel, or ASAP, said it would be "unwise" to abandon NASA's Ares 1 rocket and turn to private companies to transport astronauts to low Earth orbit. The board said potential commercial crew transportation providers do not meet NASA safety standards for piloted vehicles." By Ian Malone on January 20, 2010 1:10 PM. As the nation looks for ways to cut out-of-control spending, one senator in particular has proposed a measure that will have a negative impact on the future of manned spaceflight. Senator Russ Feingold, (D-Wis.), has proposed the Control Spending Now Act which would cause the plans to return astronauts to the moon to be delayed by some five years. Continue reading Feingold Control Spending Now Act. By Keith Cowing on January 19, 2010 11:06 PM. "NASA Administrator Charles Bolden has named William Wrobel as director of the NASA Goddard Space Flight Center's Wallops Flight Facility, Wallops Island, Va., and director of the center's Suborbital and Special Orbital Projects Directorate. This directorate manages the agency's sounding rockets and scientific balloon programs." By Keith Cowing on January 19, 2010 1:31 AM. "Hmm .... Sanjay Gupta - in Haiti as a "journalist" for CNN - ended up doing emergency neurosurgery on "a Haitian victim on a Navy aircraft carrier - in front of the cameras. CNN "journalist" Anderson Cooper grabbed some poor kid covered in blood that a mob was trying to kill - and saved his life - in front of the cameras. As a 4th estate purist, I wonder what your take would be on this? I would guess that you'd say that Sanjay and Anderson should have just stood by and let things happen - while the cameras rolled. Journalists do not "participate" in things, right?. Nor are they human, right? How 20th century. Any response will be posted verbatim on NASAWatch." "There is some conflict between these correspondents' dual roles. Not intervening in a story is a central tenet in journalism, but as doctors, these individuals are compelled to attend the sick and injured when they can help. ... Even at NASAwatch Keith Cowing baits a NASA public affairs administrator who Cowing says takes a hard line on non-interventionist journalism." Will NASA No Longer Boldly Go? By Keith Cowing on January 18, 2010 10:55 PM. "When experts try to read the tea leaves, they're not hopeful about human space exploration in the next decade. "There won't be any," says space policy expert John Logsdon of George Washington University. Instead, he and others suggest, the administration probably will continue support of the International Space Station, which hangs in low-Earth orbit and eats up money that otherwise could send astronauts to the moon, Mars or asteroids. "Clearly, NASA is at a crossroads," says science historian Michael Robinson of the University of Hartford (Conn.). "We are revisiting some questions of a century ago about what we want out of exploration as a nation as we look to space." Continue reading Avatar: A Stunning New World That NASA Continues to Ignore. By Keith Cowing on January 15, 2010 7:50 PM. "The Boeing Company, part of both the United Space Alliance and United Launch Alliance has laid off a total of some 36 of its employees at NASA's Kennedy Space Center. These employees run the range from general support personnel to engineers. The employees were given two month notices. Boeing has hundreds of employees that work in the shuttle program, most of whom will lose their jobs when the shuttles are mothballed. More layoffs will happen in the spring and again in the fall." By Keith Cowing on January 15, 2010 5:51 PM. "Miles O'Brien and "This Week in Space" are back for their first show of 2010. In this episode: the space nation awaits direction from President Obama, Endeavour gets ready to deliver a room with a view, how an abandoned McDonald's is being used to restore closeups of the Moon, a space telescope finds new planets, plus an interview with Hubble-Hugger-In-Chief John Grunsfeld. You also can subscribe for free to watch episodes from iTunes." Also featured is the return of Moon rocks and Everest rocks by Scott Parazynski to NASA for placement inside Node 3 on the ISS. By Keith Cowing on January 15, 2010 11:13 AM. "Fifty percent (50%) of Americans now say the United States should cut back on space exploration given the current state of the economy, according to a new Rasmussen Reports national telephone survey. Just 31% disagree with cutting the space program, and 19% more are not sure. The new findings mark a six-point increase in support - from 44% last July - for cutting back on space exploration." By Keith Cowing on January 15, 2010 12:09 AM. Keith's note: Alan Stern, Dan Durda [two videos] and ten other scientist took two rides in a centrifuge located at The NASTAR Center as part of a suborbital scientist training program held on 12 & 13 January 2010. On these runs the scientists were put through simulated rides aboard Virgin Galactic's SpaceShipTwo. The first flight was at 50% acceleration. The second flight was at 100% acceleration. You will note by his commentary that Dan Durda was determined to get on NASA Watch. By Keith Cowing on January 14, 2010 8:43 PM. "For this diverse group of scientists to invest their own time and money for astronaut training is a true testament to the growing excitement behind the science potential of new commercial spacecraft," said Dr. S. Alan Stern, chairman of SARG and a principal organizer of the scientist training program. "Interest was so high that we've already filled up a second class of a dozen scientists for spring 2010." By Keith Cowing on January 14, 2010 6:12 PM. Keith's note: Early registration deadline is tomorrow, 15 January. Register here. By Keith Cowing on January 14, 2010 5:29 PM. "NASA is investigating how a small amount of cocaine ended up in a space shuttle hangar at the agency's Florida spaceport. A bag containing the cocaine residue was discovered in the space shuttle Discovery's hangar at NASA's Kennedy Space Center in Cape Canaveral, Fla. The hangar, known as the Orbiter Processing Facility, is a restricted zone for shuttle workers only." "NASA has launched an extensive investigation after a small amount of cocaine was found in a restricted area of the processing hangar for shuttle Discovery at Kennedy Space Center, Fla. There are no indications the incident has impacted Discovery's readiness for its planned launch in March." By Keith Cowing on January 14, 2010 5:07 PM. 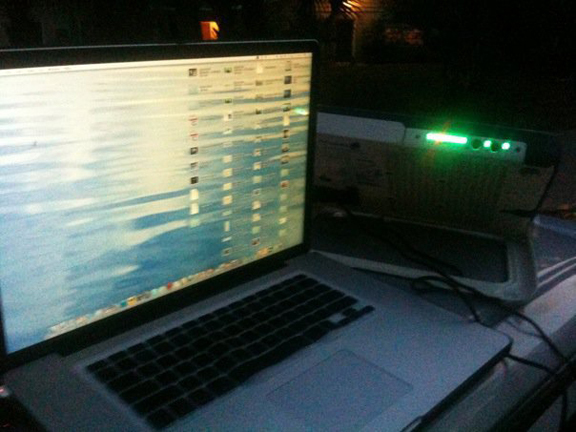 Keith's update: here is our BGAN in operation in Haiti. Keith's note: Earlier today I had a telecon with Miles O'Brien and David Waters. You have seen them both (along with Leroy Chiao) on SpaceflightNow.com's shuttle launch webcasts. David is headed for Haiti on Saturday - and he is taking the HNS9201 BGAN satellite phone (image below) that Scott Parazynski and I took to Mt. Everest last year. I will be giving David a quick intro on BGAN ops in remote locations tomorrow morning. Continue reading From Everest to Haiti - Update. By Keith Cowing on January 14, 2010 2:43 PM. "According to the NASA email, NASA's incorrect temperature readings resulted from a "flaw" in a computer program used to update annual temperature data. [James] Hansen, apparently frustrated by the attention paid to the NASA error, labeled McIntyre a "pest" and suggests those who disagree with his global warming theories "should be ready to crawl under a rock by now." Hansen also suggests that those calling attention to the climate data error did not have a "light on upstairs." By Keith Cowing on January 14, 2010 2:27 PM. "While commercial and DOD space system missions, requirements, and technology development differ in key ways, the commercial sector has adopted practices that could be applied to DOD space system acquisitions to improve cost, schedule, and performance outcomes. For instance, commercial firms define their requirements before initiating development programs, which helps to close resource gaps prior to program start and limit requirements growth. They tie contractor award and incentive fees to acquisition outcomes. They follow evolutionary product development approaches that enable them to achieve gradual gains in capability in relatively short periods while limiting the extent of technology risk they take on in any one increment. The commercial approach, overall, emphasizes gaining critical knowledge before making long-term commitments." By Keith Cowing on January 14, 2010 2:00 PM. Keith's note: Archived streaming video of suborbital scientists undergoing centrifuge training at NASTAR is now online here. Higher quality video will be posted shortly. By Keith Cowing on January 13, 2010 9:07 AM. "The Suborbital Scientist-Astronaut Training Course [Tuesday/Wednesday, 12-13 Jan] has been developed by The NASTAR Center and is organized by Dr. Alan Stern and Dr. Dan Durda of the Southwest Research Institute (SwRI). " By Keith Cowing on January 12, 2010 6:53 AM. "Lenny Klompus, a spokesman for Hawaii Gov. Linda Lingle, says the rocks were never actually missing. He says state employees knew the rocks were in a secured cabinet, but they didn't know which cabinet." By Keith Cowing on January 11, 2010 11:45 PM. "Over 500 of you responded to the Langley Story survey and we will shortly have some preliminary results. The next step is a series of focus groups to further define what kind of an organization we are and what prompts us to come to work each day." Keith's note: One would assume that people are prompted to "come to work each day" because that is what you do when you have a "job" i.e. you go to work - each day. By Keith Cowing on January 11, 2010 10:09 PM. "A former high-ranking NASA official pleaded not guilty Monday to nine federal charges accusing him of steering a $600,000 contract to Mississippi State University, a client of his consulting firm. Courtney A. Stadd had already been convicted of steering a different contract for almost $10 million to the university. Stadd was sentenced in November to three years probation." By Keith Cowing on January 11, 2010 10:05 PM. "NASA's Deputy Administrator, Lori Garver, will be the opening keynote speaker at the Next-Generation Suborbital Researchers Conference on February 18-20, 2010, at which scientists, engineers, educators, and vehicle developers will gather to discuss the research and education benefits of new commercial suborbital spacecraft." By Keith Cowing on January 11, 2010 9:45 AM. Keith's note: Twitter has some 18 million active users. We've already seen how Twitter has started to alter how news and ideas are spread - instantaneously - with major TV networks scrambling to pay attention. To its credit, NASA was an early adopter and now makes remarkable use of Twitter - and is learning fast how to use other social networking tools. Twitter is paying attention - hence this banner - one that appears with regularity on Twitter. Alas, while NASA has pushed the envelope with regard to social media, its Assistant Administrator for Public Affairs at NASA Headquarters, Morrie Goodman, has (privately) expressed deep skepticism with regard to the value of these tools. Is Morrie offering a reality check, or reaffirming the status quo of ideas and paradigms that are no longer relevant? What is it that Twitter sees in NASA - that NASA does not see in Twitter? Keith's 11 Jan update: Morrie Goodman does not agree with what I have posted. If/when he sends me a formal response, I will be happy to post it - verbatim. Keith's 14 Jan update: Still waiting for Morrie Goodman's comments. By Keith Cowing on January 10, 2010 9:27 PM. "During our initial review of the five program plans, we found that each had a number of minor compliance issues when compared to the OMB Guidance. Specifically, none of the five program plans included a description of periodic reviews of planned Recovery Act-related activities in the Monitoring and Evaluation section. In addition, one program plan did not identify projects and activities funded under the Recovery Act and did not address the section on Federal Infrastructure Investments." By Keith Cowing on January 10, 2010 1:39 PM. "The launch of Shuttle Endeavour on the STS 130 flight now faces a potential delay due to technical problems with the external ammonia connecting lines which are designed to provide critical cooling capability to the new Tranquility module. Tranquility is a pressurized module being brought aloft as payload in the cargo bay of Endeavour on the STS 130 mission. Launch of Endeavour is currently set for 4:39 AM on Feb. 7." By Keith Cowing on January 8, 2010 11:03 AM. - Keith's note: Linn LeBlanc, Executive Director, Astronaut Scholarship Foundation sent a note out to a bunch of people who, in turn sent it to other people. I eventually got 7 copies. I posted it here - as I have in the past in similar situations thinking it would be nice for readers to also send in wishes. The Astronaut Scholarship Foundation then called me to complain that it was posted with contact information so I removed it. I certainly wish Mr. Fullerton well and hope that he has a speedy and full recovery. However, the Astronaut Scholarship Foundation really needs to take a few PR lessons i.e. if a family (understandably) wants privacy then the Foundation should not send out an email to people that contains home addresses and emails and openly ask people to send cards and messages. By Keith Cowing on January 7, 2010 4:12 PM. Keith's note: At a time when substantial job cuts loom for the Florida economy due to Shuttle retirement, and Recovery Act money is flowing steadily elsewhere in the U.S., one would think that NASA would be looking at ways to offset some of the post- Shuttle economic impact. Guess again. In July 2008, scientists at the University of Central Florida proposed the $50 million "Global-Scale Observations of the Limb and Disk" (GOLD) mission to NASA's Explorer program. After NASA and scientific community peer review this experiment was selected for Phase A development and funding as a mission of opportunity under its Explorer science space program. Despite getting excellent ratings, and a recommendation by its own Explorer review panel to proceed, NASA Science Mission Dorectorate AA Ed Weiler decided not to select the mission for full development due lack of funds. Once again, it would seem that SMD's inability to cover cost overruns on large projects such as the Mars Science Laboratory continues to have a negative ripple effect on new science missions. Oh yes, there is another large MSL overrun that will be announced soon. Rep. Susan Kosmas (D-FL) has taken this mission's plight under her wing and has been working hard to get some face time with NASA on this topic. Alas, the office of Sen. Bill Nelson (D-FL) has not done anything of consequence to probe this matter further. This inaction on Nelson's part is rather odd given his rhetoric on other issues facing Florida's workforce. By Keith Cowing on January 7, 2010 12:29 PM. "Retired Gen. Lew Allen Jr., a nuclear physicist who led the National Security Agency and served as the senior uniformed officer in the Air Force before heading NASA's Jet Propulsion Laboratory in the 1980s, died Jan. 4 at home in Potomac Falls of complications from rheumatoid arthritis. He was 84." By Keith Cowing on January 7, 2010 9:11 AM. Moon Rocks - From the Moon to Everest and the Space Station from SpaceRef on Vimeo. Continue reading Video: History of Two Worlds on Orbit. By Keith Cowing on January 6, 2010 2:48 PM. "NASA has launched an initiative to use its out-of-this-world missions and technology programs to boost summer learning, particularly for underrepresented students across the nation. NASA's Summer of Innovation supports President Obama's Educate to Innovate campaign for excellence in science, technology, engineering and mathematics, or STEM, education." "Today, President Obama's only public appearance will be early afternoon remarks honoring educators who received awards for math and science teaching." "Other elements of the initiative include a $13.5 million expansion of a university-based program called UTeach that aims to deliver 7,000 expert teachers by 2018; a commitment from public universities to prepare 10,000 math and science teachers a year, up from 7,500 annually; and efforts by NASA and PBS to promote effective math and science teaching." Keith's 5 Jan Update: According to non-NASA sources there will be some sort of announcement by the President tomorrow regarding education. It is expected that the "Summer of Innovation", among a number of other education-oriented projects, will be announced as part of this event. Once again, this project offers NASA an opportunity to reach a much broader audience than would normally be the case - with the full support of the White House. It would seem that this White House sees that there is more to NASA's value than just launching rockets. Keith's 30 Dec note: President Obama will soon unveil a large, interesting educational event targeted for the summer of 2010. Titled "Summer of Innovation" this project is aimed at reaching 1 million students and working to raise their STEM skills through a variety of activities. The lead person at NASA on this effort is White House Fellow Nicole Campbell. The cost of this project is still uncertain - numbers as high as $200 million were discussed internally at one point. Much of the work would apparently be channeled through/paid for by Americorps. The latest version of this project would entail NASA taking much of the lead along with the Department of Education. Each NASA center would be asked to dedicate one person to this activity. The most recent version of the plan would limit this activity to only 5 states. As to how the 5 states will be selected - that remains uncertain. These uncertainties aside, it will be interesting to see how prominence for NASA in such a high visibilty event will affect the public's preception of NASA's value to the public. One would hope and expect that it would be overwhelmingly positive. Stay tuned. "NASA is fortunate to have an outstanding White House Fellow assigned to our agency this year, Ms. Nicole Campbell. Nicole is spearheading some new exciting endeavors designed to enhance our current education outreach activities and focus our resources in order to get the maximum benefit for each dollar we spend. One such program is what we are calling the "Summer of Innovation." We are still in the planning stages so I won't go into a lot of detail here today, but you will be hearing more about this toward the end of the year." Continue reading NASA and the Summer of Innovation - Update. By Keith Cowing on January 6, 2010 8:57 AM. "NASA Administrator Charlie Bolden gave the keynote address at the 215th American Astronomical Society (AAS) meeting held in Washington, DC. With some 3,500 in attendance and more than 2,200 scientific presentations this is the largest astronomy meeting in history. Some of the topics discussed at this year's event include black holes, exoplanets, exploding stars and pulsars." By Keith Cowing on January 4, 2010 9:02 PM. Keith's note: According to Dryden Management Meeting Minutes (DM3) David McBride has been named permanent Center Director of Dryden. He was the Deputy Director and has been acting Center Director since Kevin Petersen's retirement last April. By Keith Cowing on January 4, 2010 2:52 PM. "NASA's Kepler space telescope, designed to find Earth-size planets in the habitable zone of sun-like stars, has discovered its first five new exoplanets, or planets beyond our solar system. Kepler's high sensitivity to both small and large planets enabled the discovery of the exoplanets, named Kepler 4b, 5b, 6b, 7b and 8b. The discoveries were announced Monday, Jan. 4, by members of the Kepler science team during a news briefing at the American Astronomical Society meeting in Washington." By Keith Cowing on January 4, 2010 12:13 AM. "Dr. John M. Grunsfeld has been appointed Deputy Director of the Space Telescope Science Institute (STScI) in Baltimore, Md., effective January 4, 2010. He succeeds Dr. Michael Hauser, who stepped down in October. STScI is the science operations center for NASA's orbiting Hubble Space Telescope and the James Webb Space Telescope planned to be launched in 2014." Keith's note: I am deliberately posting this press release - in advance of the embargo claimed by STScI - given that NASA HQ PAO has repeatedly told me - officially - that official agency policy is that no news releases regarding NASA research or news are ever to be issued under media embargo. Moreover, two NASA civil servant PAO officers are listed on this release, John Grunsfeld is a NASA employee, and STScI is wholly funded by NASA. If NASA PAO is going to claim that a policy regarding embargoes exists, then it needs to enforce that policy. Otherwise their "policy" is hollow and pointless - and also not in the best interest of the taxpayers who pay for this research in the first place. Oh, by the way, I already have several press releases regarding wholly NASA-funded research that are under embargo - in direct contravention to stated agency policy. Again, where is the "transparency"? Where is the "openness"? As for John's selection itself? Superlative - amazingly so. By Keith Cowing on January 3, 2010 3:00 PM. "President Obama will chart a course for NASA within weeks, based on the advice of a handful of key advisers in the administration and Congress. Obama, who met Dec. 16 with NASA Administrator Charles Bolden, hasn't said when or how he'll announce his new policy. The announcement likely will come by the time the president releases his fiscal 2011 budget in early February, because he must decide how much money the space agency should get." Keith's 4 Jan update: According to NASA HQ PAO: "Weiler and Garver are not scheduled to speak at this event. As usual for this AAS event, the NASA Town Hall is hosted by SMD Astrophysics director Jon Morse with SMD Chief Scientist Paul Hertz in attendance." Keith's 23 Dec note: The audience at the AAS meeting will be composed of several thousand scientists with a large number of journalists and bloggers. The questions that the audience asks of Mr. Bolden (assuming that he takes questions) and other NASA officials should be interesting. Mars Science Lab overruns continue to drain funds from other things that SMD should be doing - with more to be announced. Webb Space Telescope overruns continue - leading to an additional drain. The inside scoop is that the NASA space science budget is flat lined in the FY 2011 budget. Also, SMD will likely be carved (back) into two entities - Earth Science and Space Science thus diminishing Ed Weiler's resources. ESMD will likely be downscoped into an exploration technology R&D group with launch vehicle development shifted to SOMD. Stay tuned. By Keith Cowing on January 3, 2010 1:49 PM. 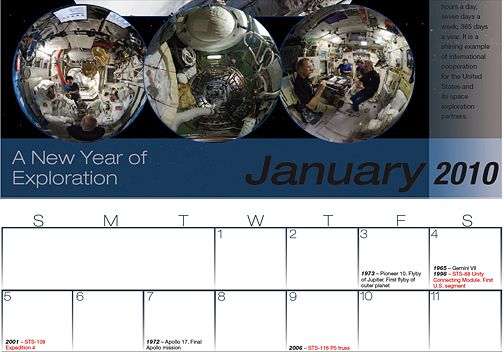 Reader note: Click on this NASA web site and download the 2010 ISS Calendar. Notice something odd about the dates? Did January 1, 2010 start on a Wednesday? Does February have 30 days? Does March have 31 days? Does April have 31 days? And December 1, 2010 is New Years Day. That's as far as I went. Doesn't anyone check these things before putting them on their web site? WOW! Must be the same group that mixed up miles and kilometers. In fairness, the website does say "(Note: In order to print the document correctly, please select the two-sided print option in your printer dialog box)" - but there is nothing on the calendar file itself that says that. Indeed, the reader who alerted me to this said "I discovered the error when I went to put the dates of my vacation on it and they didn't match up with my airline reservation dates. I got nervous and checked another calendar and discovered the mistake. That's when I discovered some of the more obvious errors.". Anyone going directly to this link (that happens a lot, you know) will not know this. Moreover, not everyone has a printer that (easily) prints in two sided mode. Indeed when I went to print it, my computer automatically scaled it to fit on an 8.5 by 11 sheet of paper - with the pages paired incorrectly - that is because of the way it was formatted (by NASA) as a PDF file.